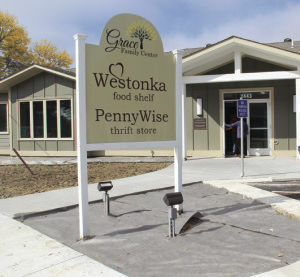 The Westonka Food Shelf and Pennywise Thrift Store serve many people in need within our community and both are housed in the Grace Family Center, a building that was born of love… read the story below! What is the significance of the Grace Family Center? The Westonka Food Shelf and Pennywise Thrift Store have provided food, clothing and hope to those of our community in greatest need for over 45 years. Unfortunately, the Annex structure that once housed these vital charities was found to be in an unrepairable condition and needed to be replaced in order for them to continue their service to the community. Our Lady of the Lake initiated a capital campaign to unite the area in the effort to raise the large sum of money necessary to build the Grace Family Center and provide the Westonka Food Shelf and Pennywise Thrift Store a home for decades to come. Although the initial capital campaign funded the construction of this important building, the operating costs are born entirely by Our Lady of the Lake Church. If you would like to donate money to help offset these costs, you can do so by clicking here. Thank you for your generosity! Our patrons receive fresh fruit, vegetables, dairy and meat, in addition to canned goods, food staples and hygiene products. We are staffed exclusively by volunteers and are always looking for more! Because we don’t have administrative and occupancy expenses (Our Lady of the Lake pays these with help from those who donate to help offset these operating costs), your donation goes exactly as to intend; to provide food for those in need. Our buying power is exponentially enhanced by our partnership with local foodbanks. A dollar donated to Westonka Food Shelf can purchase $9 or more worth of groceries. Consider various other donation options to the Westonka Food Shelf today!